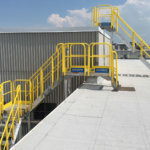 A customer needed an upper mezzanine safety gate for forklift drivers to transfer pallets of paper from the floor to this upper mezzanine while improving employee safety. With our YellowGate XLP (powered version), YellowGate was able to provide a safe OSHA compliant barrier gate that also significantly improved productivity. The forklift driver can now open safety gate remotely, whereas previously they had to open the gate by going up to the mezzanine, then go back down to load the pallet of paper, the return to close the gate. As you can imagine, that’s a lot of daily trips up and down to the stairs to the mezzanine area with the risk of just leaving the gate open to make the operators daily job easier.